Slip our "Happy Easter" pressed penny in an Easter egg for a special surprise. This penny makes a nice holiday party favor or add it to your collection of pressed pennies. Bulk Pricing - We are happy to offer bulk pricing for Personal and Wholesale accounts, please inquire about pricing. Custom Designs - We would love to work with you to make a custom penny whether it be for Personal, Business, Retail, and Wholesale use, please inquire about pricing. 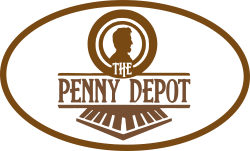 Souvenir Shop or Retail Store - We would love to talk to you about becoming a retailer or making a custom penny for your location.